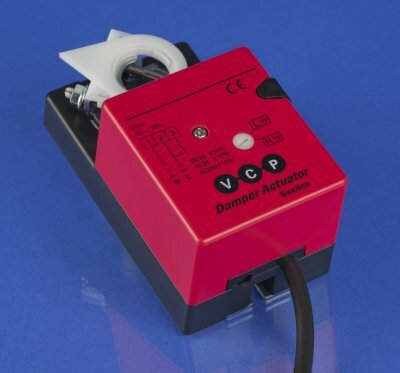 VCP non-spring return damper actuators are suitable for many applications including motorised control of dampers in ventilation systems such Building Automation Systems (BAS), Building Management Systems (BMS) or Heating, Ventilation, and Air Conditioning (HVAC) environments. Solutions for VCP non-spring return damper actuators are ideal for control dampers, air handlers, economizer units, VAV terminal units, fan coil units, fan shutters, and unit ventilators. VCP non-spring return damper actuators to be direct mount on standard damper shafts to control dampers. The RA2-series non-spring return damper actuators with torque 2 Nm are used to regulate dampers up to approx. 0.5 m². The RA2 24D and RA2 220D non-spring return damper actuators are with control signal on/off (two-position) and the RA2 24V non-spring return damper actuators is with control signal 2-10 Vdc. Auxiliary switch equipped on the on/off non-spring return damper actuators types RA2 24D S1 and RA2 220D S1. Feedback signal is standard on the 2-10 Vdc non-spring return damper actuators RA2 24V and RA2 24V S1. The 2 Nm non-spring return damper actuators RA2-series are equipped with position indicator, manual override by push button and with with 0.9 m cable, direction of rotation changeable via L/R switch outside damper actuator. Write us an e-mail in the contact form below straight away.